The Ultimate Drip Irrigation Kit for Small Farms can water up to 25 rows and includes two complete Head Assemblies. Includes 3/4" Poly Tubing for mainline allowing higher flow rates and longer drip tape runs. This is a complete, self-contained drip irrigation kit that comes with everything you need to create a working system. The drip irrigation tubing (or tape) in this kit can be cut with ordinary household scissors, box cutter or tin snips. You can view and/or print the detailed installation instructions by clicking on the button below the parts list. This kit includes everything you need to hook up to any standard outdoor water faucet or garden hose connection. Only hand tightening is required for all of the threaded irrigation parts. Image displayed may not depict the actual items included in this kit. An itemized list of parts that are included in this drip kit can be found below. Drip Depot drip irrigation kits are completely modular in design. Even though this kit is completely self-contained and will work perfectly right out of the box, there is nothing stopping you from adding additional irrigation parts to this kit as long as you stay within the capacities and limits of the individual drip irrigation components. This means you can mix and match parts to achieve exactly what you want out of your new drip irrigation system. If you are not sure which kit is right for you, just add this kit to your compare list to get a side-by-side comparison of two or more kits to find the kit that is closest to your needs. Add this kit to your shopping cart, then add additional items to your shopping cart along with the kit. If you want more of the exact same items that are included in the kit, just find the item in the itemized parts list (below) and click on it. From that page, you can add more of any of the items that are included in the kit. Use this kit (or any of our kits) to build your own customized drip irrigation kit. Just click the "Customize" button above to start building your own customized drip irrigation kit. Choose a larger kit and save the extra parts for repair or future expansion. 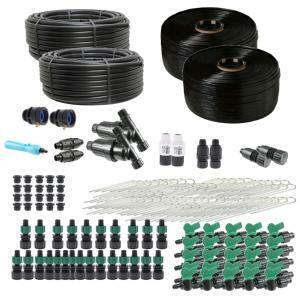 Drip Depot irrigation kits are the leading brand of drip irrigation kits in America. We have been designing and building our drip irrigation kits in the USA for years using only the highest quality components. In fact, many of the components of our kits are actually "agricultural quality," meaning they are designed and manufactured for the harsh conditions found in commercial agricultural use. We design our kits with these components because we know they will last for many years without failure. 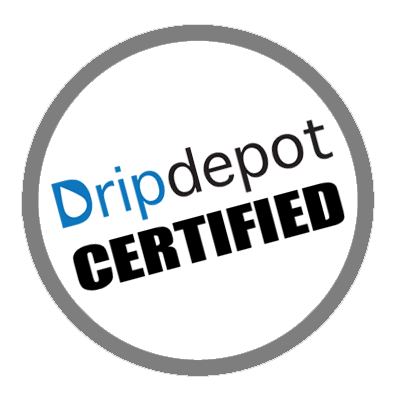 When shopping for your new drip irrigation kit, please look for the "Drip Depot Certified" label to ensure you are getting the highest quality items. If it doesn't say "Drip Depot Certified," then it's not.